I could write a very lengthy story about the forthcoming DMC finals but it's very late, I'm very tired and frankly everything you need to know is in the above flyer. 2 days of scratch madness, but get a load of the Summit 2 - 7 DMC world champions on one stage. Miss this at your peril. Get over to DMC World for tickets. The battle royal approaches - the battle for supremacy name ownership... OK OK just kidding. 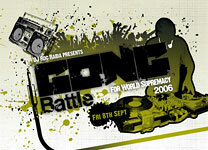 But indeed - Roc Raida's Gong Battle will be hitting the UK in a matter of weeks. And I've got a little update for you. Tickets are now available from the Ebsel site so snap them up quick as Bar Rumba is an ickle biddy club and only takes 500 hot and sweaty bods. And the combatants will be using a special edition Stanton SA-5 complete with new paint job and a Pro X Fade. Well... not quite house calls but coming to a town possible near you in the UK is the Pioneer demomobile, driven rather expertly by Rik Parkinson - Pioneer's product expert and allround camera friendly demo guy. Rather than spend many thousands (and I do mean many) on putting on a huge stand for me to play with the latest gear and clean out the aftershow stand party at PLASA, Pioneer very selfishly wisely decided to take the gear to the people who need to see it - the end user. So the Pioneer UK Roadtrip will no doubt give you a chance to have a dabble on their latest hardware or at least get the chance to try and understand what all those knobs, buttons and outputs actually do. In my quest to bring you the best reviews, I often talk to companies outside of the normal DJ radar. While researching the inner ear headphone market, Ranieri PR in the UK weren't able to provide some earphone samples to me but did offer the ZIPLINQ Road Warrior Deluxe kit up for test. Whilst not strictly being DJ gear, the advancing digital age means we're becoming just as concerned with computer issues as we are sound issues. 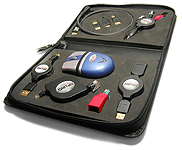 This kit has everything you'll need to hook anything up via USB and then some - in a handy travel size case. So why not review it - it a company is nice enough to send me stuff, I'll review stuff. After having had a particularly depressing week, I needed a little pick me up. Now I've said before that I love getting stuff in the post and something arrived yesterday that has cheered me up no end. Being addressed to "Matt Settle" was funny enough but the fruit machine sticky tape was just the thing to bring a smile to my face. 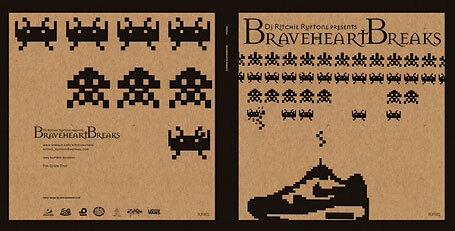 Inside the vinyl sized package was... well... vinyl - in the shape of Ritchie Rufftone's "Braveheart Breaks". Each year, Denon bring us a surprise or 2 just in time for PLASA. 2004 saw 2 scratch mixers and a mini player, last year brought us the potentially great DN-S3500 (still waiting for that unit guys so we don't know for sure...) and this year D-Day arrives with what feels like a tiny fanfare rather than a Denon roar. Snapping at the heels of Cortex and Numark, Denon are previewing (it's not ready yet) the DN-HD2500 - a dual head HD based player with USB and a built-in 2.5" HD. 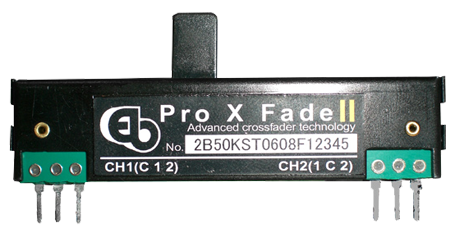 Details are thin other than the picture and brief details being shown over at the Denon DJ forum. For those of you who've followed the birth and development of skratchworx, you'll know that a few months ago, I took my financial life into my own hands and quit the 9-5 to live my dreams. Sadly plotting to take over the planet from a secret island populated with Gizmo-worshipping PVC clad martial arts trained hotties is a little out of my budget right now so I guess I'll have to make do with making skratchworx the very best it can be from the skratchlab. The next version of skratchworx - V3 - will be a serious upgrade but to achieve this, I need time. As we know time equals money and this couldn't be truer right now. So in a bid to make V3 a reality, the skratchworx advertising and sponsorship doors are open. As the DMC finals approach, a clearer picture of just who is and isn't defending is becoming clear. Pro Zeiko will be defending the supremacy crown and C2C will also be defending the teams crown (is it just me or is it rather a formality?). But the biggest shock is that 2 times winner ieMERG won't be defending his crown for the 3rd time. He's gone into great depth in is myspace blog for those that care to read his epic response - and this basically means that Pfel is defending in his place (covered in the blog). Regulars will know that in the whole scheme of things, I'm old school - in age and b-boy style. I'm still rocking fatlace shelltoes and even on occasion rock my OG Gizmo brass buckle. Hell I've even started busting moves again despite family warnings of being a little too old (and eversoslightly embarrassing). So the best I can do is watch videos, DVDs and... looky here even play a computer game. Sony Computer Entertainment Europe brings you "B-Boy�" for PS2 and PSP. This doesn't look like another dance mat console game - think beat 'em up (but without the violence) quality but for old schoolers like me who can't risk putting a hip out. Oh and for you hip young things as well. Isn't it nice that should your lump of hardware not quite perform as it should or indeed you just want it to do a little more, then an update is but a download and burn away? 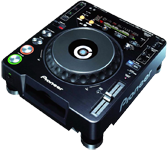 Pioneer think so as well and have a new firmware update for their CDJ-1000mk3 on the way. Coming to you on 20th August, this update takes the firmware to v2 and fixes a BPM display problem. You'll be able to grab it from Pioneer's DJSounds site soon. Henry Ford allegedly said of his Model T Ford - "You can have any colour as long as it's black". Well Rane isn't happy with that so to add a little colour (well a lot actually) to your Serato spinning sessions, you can now get red, blue and yellow control records. Available from the Rane online store or probably from your local dealer sometime soon, they come in at $15 - $5 more than the black. Life is full of little coincidences. I knew of the Korg KAOSS pad but up until Monday, I hadn't even touched one. Visiting Mista Ed's place gave me the opportunity to make them love the Rodec Scratchbox like their firstborn but also for me to experience the KAOSS PAD 2 for the very first time. And from the short play I had, I was suitably impressed that I thought it would be a good idea to get one in to put through the usual skratchworx review machine. But by pure coincidence, an email arrived from Korg Japan, telling me that they love skratchworx and that they have a new KAOSS PAD 3 coming out. So while we wait for the review unit to arrive, take a look at the official info. Just wanted to jog the brains of our US readership about the Numark Milestones competition. The deadline for entries is August 30th and you could be in with a chance to win a humdinger of a prize. So if you're an unsigned DJ, MC, songwriter, performer or producer, get your entries in ASAP. There's an old English saying - it's grim ooop north. But believe or not, we do have electricity, running water - even cars. We also have a strong DJ scene, strong enough that we have our very own DJ show - The Mobile DJ North Show. But it's not all Karaoke and glitter balls - this was the first public outing of the new Pioneer DVJ-1000, showing that the big boys want to support the smaller shows, especially the ones that allow the DJs to properly get their hands on the gear. I popped along with a camera and came away with a sense that the mobile DJ scene has more pull than you might think. WIN FREE OBEY CLOTHES! OPEN TO EVERYONE!! It's been a hot minute (to talk like all you cool types) so it's competition time folks - well when I say competition, it's more like a matter of sending an email to me and praying that I pick your name out of the specially created inbox. To tie in with Guitar Center's Spinoff 06 battle, sponsors and spiffy purveyors of cool Obey Clothing have got together a "head to toe" prize pack. Essentially it's 2 pairs of "pants" (that's trousers to the rest of us), a jacket, 3 t-shirts, shorts and a hoodie. If you want to try and win this (which frankly is quite hopeless as I need some new clothes), just drop a line to the competition hotline headed "Obey". You've got until August 16th. Be aware that this is an opt-in competition - your email address will be forwarded onto Guitar Center, so if you're not happy with that, don't enter. The interweb is brilliant. It brings you skratchworx, endless v1agra emails and as much pr0n as your addled brains can handle. But should you find yourself at a loose end between those pastimes, why not check out live streams of the DMC World Finals? PlusStream are once again offering live video feeds from both days of the world finals. One day costs �4.99, both days for the paltry sum of �9. Jump over there now and get signed up. 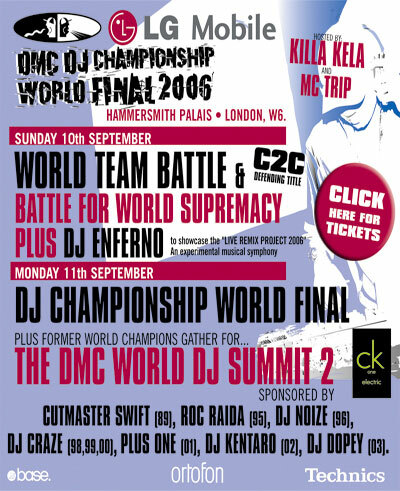 The second weekend in September is a battle sandwich - Gong Battle on one side, DMC the other and PLASA 2006 in the middle. After a lull a couple of years ago, last year's event picked up the pace a little, although moods were dampened a tad with some Earls Court pre PLASA floods. This year however, things could be a little different with some very big names notable by their absence. Still - there's going to be plenty to see and with the worldwide battle bus in town, PLASA should be quite interesting. It would be a lie for me to make out that I know a single thing about this story so I'm just going to make it up and pad it out in an attempt to appear to have my finger on the throbbing pulse of the DJ scene. Seems that QBert and Thud Rumble have completely organised/sponsored/lent their name to (delete as applicable) a new American/Pop Idol style contest - but for DJs... OK that really is the sum total of my knowledge but emails and IMs have been sent so hopefully an update will appear later. Big up Kper for unearthing this. The source is here.